Reboot of the long running killer puppets franchise. When '80s horror audiences eventually grew tired of the many Gremlins rip-offs that had clogged up video store shelves, they turned instead to a wave of Child's Play knockoffs that proliferated at the end of the decade. One of the most popular was 1989's Puppet Master. The brainchild of producer Charles Band, Puppet Master spawned no less than 11 sequels, all concerning the exploits of a bunch of killer dolls created by André Toulon, a puppeteer who fled the Nazis to the US, where he blew his brains out to avoid capture. Puppet Master: The Littlest Reich reboots the series, making Toulon, played here by Udo Kier, a Nazi himself. As we see in a prologue set in 1989, Toulon has programmed his dolls to act out the whims of the Reich, targeting minorities. 30 years later, a convention marking the 30th anniversary of the Toulon murders is held at a remote Texan hotel. Assembled at the convention are a bunch of doll collectors, all hoping to get rich by auctioning off their Toulon creations. Unfortunately for the hotel guests, they all happen to represent minorities - Jews, African-Americans, gypsies, lesbians - and find themselves targeted when Toulon's malevolent marionettes wake from their 30 year slumber and embark on a bloody killing spree. What makes The Littlest Reich stand out from its predecessors is the surprising fact that it boasts a script from a writer as highly regarded as S. Craig Zahler (Bone Tomahawk, Brawl in Cell Block 99, Dragged Across Concrete), one he penned back in 2011 before his career took off. It's no surprise then that the movie's dialogue and characters overshadow its horror elements. Much of the first half plays like a '90s Kevin Smith movie, as we spend time hanging out with our three leads - Edgar (Thomas Lennon), a recently divorced comic book illustrator whose younger brother died in mysterious circumstances and who now finds himself in possession of one of Toulon's sinister creations; his unlikely girlfriend, Ashley (Jenny Pellicer); and his obnoxious comic book store owner boss, Markowitz (Nelson Franklin). Edgar and Ashley are an affable pair from the off, but it's Markowitz who lets us know we're in Zahler territory. There's nothing Zahler likes more than setting up a character as reprehensible, only to gradually force us to warm to them. Markowitz begins the movie as the archetypal misogynistic, self-centred, neckbeard fanboy, but when the Nazi dolls start their slaughter, he embraces his Jewish identity and becomes an unlikely heroic figure. Even minor characters, like bartender Cuddly Bear (Skeeta Jenkins) and anime loving waitress Nerissa (Charlyne Yi), are invested in just enough by Zahler's script to make us root for them when they come under inevitable attack. 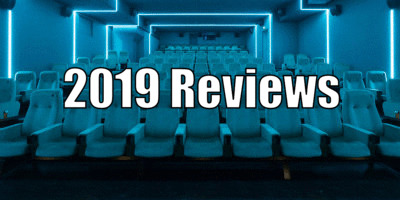 Unfortunately, Zahler fails to imbue the film's animated antagonists with the sort of distinct personalities they boasted in the franchise's earlier instalments. All the old favourites are here - Blade, Pinhead, Tunneler, Torch et al - but they somehow feel like imposters here, lacking the dubious charm of Band's originals. It's also impossible to take any guilty pleasure from their murderous rampage, as unlike earlier entries in the franchise, where many of their victims had it coming to a degree, here they're massacring the sort of people who are victimised in reality for their ethnicity or sexuality. In the hands of Scandinavian duo Sonny Laguna and Tommy Wiklund, The Littlest Reich is amateurishly directed. On paper, Zahler sets up some outrageous (and outrageously offensive!) deaths, but Laguna and Wiklund stage them in a manner that makes them come off as bland at best, incomprehensible at worst. The climactic convention massacre should have all the splatstick impact of the glorious central slaughter of Alexandre Aja's Piranha 3D - and in Zahler's script, all the elements are there - but it's so messily constructed it barely has an impact. The Littlest Reich may be viewed as a misstep by devotees of the long-running series (switching Toulon from a Jewish survivor to a Nazi might be the biggest betrayal of a fanbase since Brian De Palma made Jim Phelps the villain of Mission Impossible), but it has enough scuzzy thrills to keep gorehounds content, and in Zahler's writing it offers more nuanced characters than you might expect from the 13th entry in a low budget horror franchise. 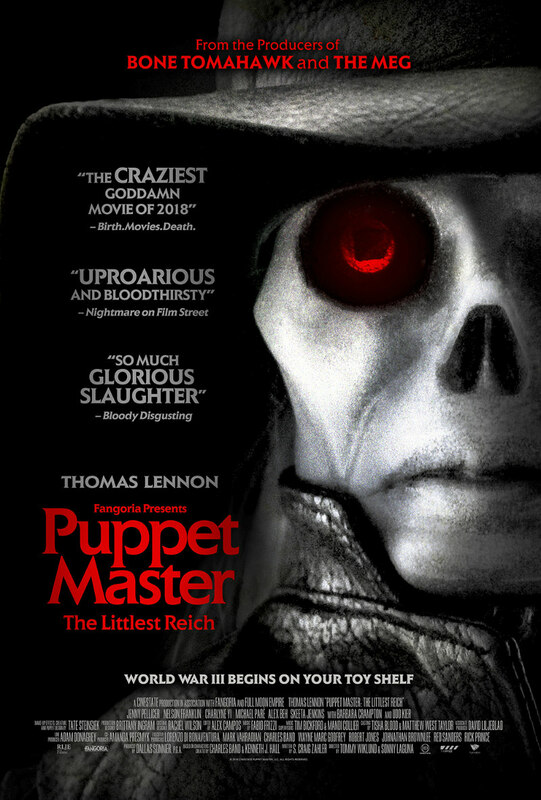 Puppet Master: The Littlest Reich is in UK cinemas April 19th.